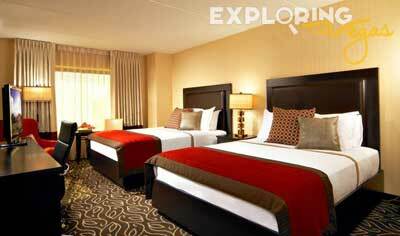 The Red Rock Casino, Resort & Spa in Las Vegas is just minutes away from the stunning red cliffs of Red Rock Canyon National Conservation Area, allowing it views of both Las Vegas Valley and the Canyon. These views, combined with gourmet dining, a tranquil spa, luxurious rooms, trendy nightlife, and non-stop casino excitement create one of Las Vegas' greatest treasures. 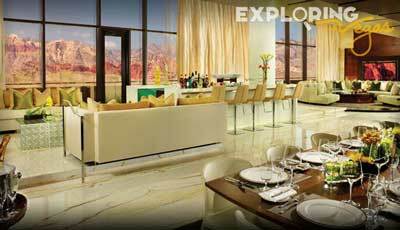 The 414 guest rooms offer fantastic views of Las Vegas Valley and the mountains. Amenities abound, including two plasma TVs, wireless and high-speed internet access, and even an iPod docking station so guests never have to part from their favorite music. Bathrooms are done in marble, containing deep soaking tubs and separate showers. For guests that need or want more relaxation, the Red Rock Las Vegas's spa is ready to serve. The spa offers numerous treatments to rejuvenate body, mind, and spirit, and includes several couple suites. There is also a full-service salon, lap pool, outdoor cabanas, a fitness area, movement studio, and boxing ring. 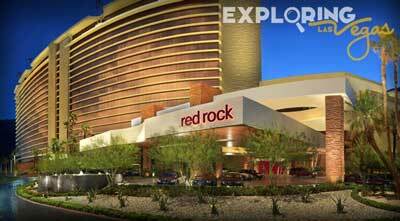 A 16-screen theater at RedRock Hotel Casino provides entertainment of the family variety. More activities can be found at three golf courses near to the resort, and of course guests can head up to the Red Rock Canyon National Conservation Area for hiking. The hotel’s 87,000 square-foot casino contains 2,700 slot and video poker machines, more than 60 live table games including blackjack, roulette and craps, and a 15-table poker room. There is even a 600-seat bingo hall making the already numerous options even more extensive. Dining includes choices like T-Bones Chophouse & Lounge, Salt Lick BBQ, Cabo Cantina, Tides Oyster Bar, and The Feast Around The World Buffet. With such an extensive collection, Red Rock Casino can suit any diner, whether seeking steak, Mexican, or seafood. Nightlife is hip at Red Rock Casino, Resort & Spa. Dancers can head to Rande Gerber’s Cherry Nightclub, or they can check out the piano bar for music and libations. There is plenty to discover at the resort. Casino, convenience store, executive floor, adventure spa, concierge, weddings, atm, handicap parking and rooms, gift shop, pool, hotel safe, storage space. AC, Plasma TVs with PPV, slippers, VOIP phones, inroom wireless internet, desk, CD player, alarm clock, iPod docking stations, hair dryer, iron with ironing board, daily newspaper. Red Rock's Race and Sports Book, Slots (features 2 Jumbo Penny Areas, Cash Bonus Blitz II and Cash Canyon), Poker Room, Jumbo Jackpot, Table games with small high limit room, Keno, Bingo. Hachi, T-bones chophouse, Terra Rossa, Salt Lick bar b-q, Tides oyster bar, Turf Grill, Feast Buffet, Sandbar, Quick serve outlets are options for dining. Zowie Bowie club, Cherry nightclub, Rocks lounge, Lucky bar are the nightlife options. Red Rock spa is the place to be during the day, and enjoy the desert sunset with a champagne at the pool bar. If you are with your kids than backyard, regal cinemas, bowling or kid quests are places to hang out.